Tales from a Loud Librarian: Happy 2016! I couldn't let the new year begin without posting here. HAPPY NEW YEAR everyone! The last two weeks off have helped to get my mind off of school. Getting a respite from the flurry of activity at school mid-year will certainly help propel me through the beginning of a new semester. I hope that others felt the same. I had a chance to read three books during the break. I was hoping to get in a fourth, but the book that I had to read and review for School Library Journal slowed me down.That always seems to happen when I pick up a book that doesn't move me. It takes longer to read because I have to psych myself up to opening the book and finishing it. It took a week, but I did finish it and submitted the review today. When I get to self select, I don't finish a book that I don't like. 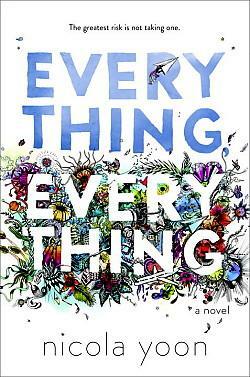 I fell in love with Everything Everything by Nicola Yoon. It was not what I expected. I never saw the twist at the end coming my way. The idea of this teenager who is sealed in her home due to illness but who is so brilliant and curious about the world was an intriguing plot line. No, I don't think that the story was rooted in reality, but it made for a really good story. It certainly gave hope at the end for new beginnings. 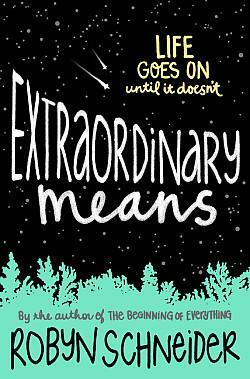 The other book that I read and really liked was Extraordinary Means by Robyn Schneider. I am a big fan of her work, and this one did not disappoint. I was surprised by some of the negative reviews that I found on Good Reads. This work is also not rooted in reality. Lane is diagnosed with a drug resistant form of tuberculosis and is sent to a facility with a 150 other teens with the same disease. He finds that his plan to continue his goal of finishing his rigorous senior year on his own and to apply to Stanford is unrealistic. I like that he had to give into his bodily needs and try to heal. I also liked the discussions between the characters of what does living really mean.This book also ended with hope for new beginnings. I didn't realize that when I picked up both of these books to read that they were so similar. Tomorrow, I am excited to start a new audio book on my commute to work. I am going to finish the last book in the Lunar Chronicles series and listen to Winter by Marissa Meyer. My kids who have read it have loved the ending, and I hope that I will, too. I have not read any of the companion books in the series, and I may not. I have lots of plans in my head for the library in the new year. I am, always plotting for new ways to encourage kids to read more. It is a struggle sometimes, but anything that I can do to push free reading may make a difference in the lives of my students. The library has received money to build a mini-makerspace. I need to start ordering the items that will be purchased. I also have money to spend on new books. I am ready to discover new and exciting ways to make the library a central part of my students' lives. I just don't know how that will look until it happens. Here's to 2016 and may it turn out to be one of the best! I like the idea of new beginnings, too. It's so strange what speaks to us and what doesn't. I didn't like either one of these books, but it might be because they were more YA and I've turned into an 11 year old in my reading preferences! The idea of a Maker Space also makes me cringe, but I hope it works for you! Happy New Year! Happy New Year to you, too! I love YA, but I also teach students in 6th and 7th grade so I have to leave myself open to reading books targeted for them. The themes in the books for middle grade readers and YA are very different. I love that books speak to some and not others because that means there is a book out there for everyone to love. I hope you post more about your makerspace. I'd love to get started, but haven't worked out the logistics in my head. I certainly will be posting here, all my successes and failures.